In many cultures, magic is an integral part of everyday life. The group known as the Rom is no exception, and they have a strong and rich magical heritage. The word gypsy is sometimes used, but it's considered a pejorative. It is important to note that the term gypsy was originally used derogatorily to refer to the ethnic group known as the Romani. The Romani were -- and continue to be -- a group from Eastern Europe and possibly northern India. 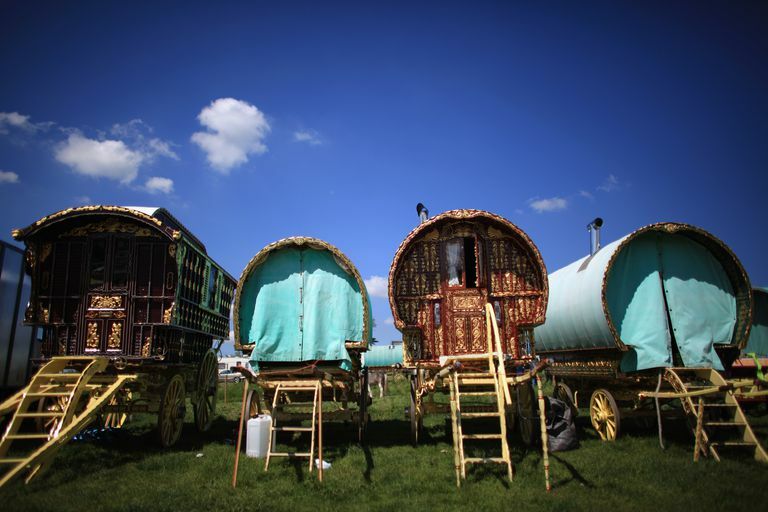 The word "gypsy" came from the mistaken notion that the Romani were from Egypt rather than Europe and Asia. The word later became corrupted and was applied to any group of nomadic travelers. Today, people of Rom descent live in many parts of Europe, including in the United Kingdom. Although they still face widespread discrimination, they manage to hang on to many of their magical and folkloric traditions. Let’s look at some examples of Romani magic that have lasted through the ages. Folklorist Charles Godfrey Leland studied the Rom and their legends, and wrote extensively on the subject. In his 1891 work, Gypsy Sorcery and Fortune Telling, Leland says that much of the popular Romani magic was dedicated to practical applications - love spells, charms, recovery of stolen property, protection of livestock, and other such things. Leland explains that the Rom are strong believers in amulets and talismans, and that items carried in one’s pocket - a coin, a stone - become imbued with the characteristics of the bearer. He refers to these as “pocket deities,” and says that certain objects were automatically conferred great power - shells and knives in particular. Among some Rom tribes, animals and birds are attributed divinatory and prophetic powers. Swallows seem to be popular in these tales. They are considered bringers of luck, and often where the first swallow is seen in the spring, treasure is to be found. Horses too are considered magical - the skull of a horse will keep ghosts out of your house. Water is considered a source of great magical power, according to Leland. He says it is lucky to meet a woman carrying a full jug of water, but bad luck if the jug is empty. It is a custom to pay homage to the gods of water, the Wodna zena, after filling a jug or a bucket by spilling a few drops on the ground as an offering. In fact, it is considered rude - and even dangerous - to take a drink of water without first paying tribute. The book Gypsy Folk Tales was published in 1899, by Francis Hindes Groome, a contemporary of Leland’s. Groome pointed out that there were a vast range of backgrounds amongst the groups labeled as “Gypsies,” many of whom came from different countries of origin. Groome distinguished between Hungarian Gypsies, Turkish Gypsies, and even Scottish and Welsh "tinkers." Finally, it should be stressed that most Romani magic is rooted not only in the folklore of the culture, but also in the context of the Romani society itself. Blogger Jessica Reidy explains that family history and cultural identity plays a crucial role in Romani magic. She says "My entire Romani identity is invested in my grandmother and what she taught me, and her identity springs from what her family could pass on to her while simultaneously obscuring their ethnicity and shedding their culture, attempting to avoid the gas chambers or a bullet in a ditch." There are a number of books available in the Neopagan community that purport to teach “Gypsy magic,” but this is not authentic Rom folk magic. In other words, for someone who is not Romani to market the spells and rituals of this particular group is nothing less than cultural appropriation - much like when non-Native Americans attempt to market a practice of Native American spirituality. The Rom tend to view any non-Romani practitioners as outsiders at best, and at worst, as charlatans and frauds. Is That Crystal Making You Feel Weird?